Since the start of the Green Revolution, the productivity of the global agricultural system has more than doubled, improving food security for a growing population and meeting dietary demands of an increasingly wealthy world. This astounding productivity has also imposed environmental costs. While global agriculture faces a number of challenges, the most surprising challenge to food security may come from agriculture’s impact on our climate. Right now, the world’s agricultural sector, which in this report refers to management and land clearing related to agriculture, accounts for about one fifth of total greenhouse gases. That’s more than all of the world’s cars, planes, and trains combined. Emissions from agriculture and deforestation are three times greater than emissions from the global building sector, and equal to all industrial emissions. In fact, energy production is the only sector that has a higher share of emissions (37 percent). In this report, we consider emissions from just part of the global food system: deforestation and agricultural management. The share of emissions from transportation of products in the global food supply chain, packaging, and food waste, for example, are important but not included here. When these activities are also considered, the global food system accounts for roughly 30 percent of global emissions. Despite agriculture’s central role in changing the global climate, there are promising opportunities for mitigating emissions and reducing the demand for high-emissions food in the first place. Developing a global food system that both achieves food security and reduces agriculture’s environmental impact is one of the foremost challenges of our time. We’re trading enormous greenhouse gas emissions for food to feed the planet. Between clearing land to farm and the farming itself, that’s 21 percent of global emissions—much more than the carbon spewing out of every car, plane, and train on Earth. Humankind’s remaining emissions come from industry (21 percent) and buildings (7 percent). AGRICULTURE DRIVES AN ESTIMATED 75 PERCENT OF GLOBAL LAND CLEARING AND DEGRADATION. 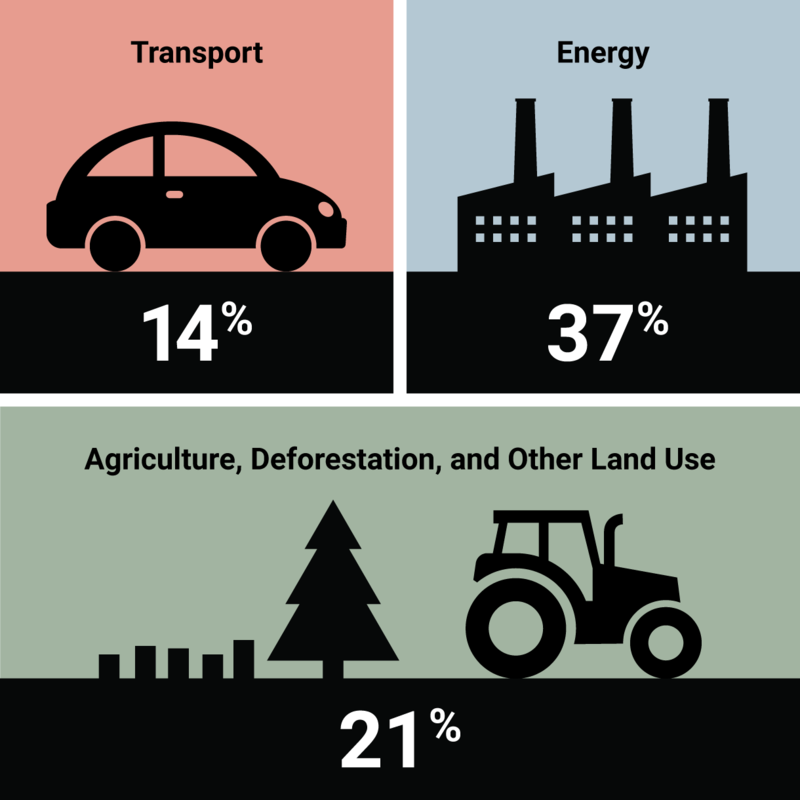 In 2012, forestry and other land use comprised about 10 percent of global emissions. Most of the land on Earth that’s suitable for agriculture has already been converted to fields or pasture. Remaining land suitable for cropland or pasture lies mostly in tropical biomes—about three quarters of tropical forests, woodlands, and savannas are suitable. Forests are often cleared to meet local food needs for smallholder farmers, but demand for global commodities like oil palm and soybeans is becoming the dominant driver. If we were to meet future food needs as we have in the past—with developing countries increasing crop production mostly through land clearing, and developed countries increasing production mostly through yield increases—it’s estimated that global agricultural emissions would increase by at least 30 percent by 2050. Today, emissions from raising livestock and growing crops are the dominant driver of agricultural emissions. Fossil fuel use, including transport, is responsible for only about 10 percent of total agricultural emissions. Since 1990, emissions from farming practices have increased by about 1 percent each year, while emissions from deforestation (and other land uses related to agriculture) declined. Agricultural emissions from deforestation, while still very large, have dipped slightly over the period, and comprise a smaller share of total emissions over time. Dominant sources of agricultural greenhouse gases (GHGs) include carbon dioxide (CO2) from tropical deforestation, methane (CH4) from livestock and rice production, and nitrous oxide (N2O) from fertilizing or burning croplands. Agriculture is responsible for about half of global methane emissions. Methane is 26 times stronger as a GHG than CO2. Ruminant livestock, including cows and sheep, digest their food through enteric fermentation, which produces methane. The result: Globally, about a third of agriculture’s methane emissions come from livestock. Burning biomass to prepare fields is another methane-maker, as is applying manure to fields. Another major methane source? Rice grown in paddies, where bacteria break down biomass submerged in the fields. Methane emissions from irrigated rice fields account for about 11 percent of emissions from agricultural management. Sixty percent of all anthropogenic N2O emissions are from agriculture. Nitrous oxide emitted into the atmosphere is a major GHG because it is 300 times more effective at warming than CO2. Most N2O is produced after croplands are fertilized, when soil microbes convert some of the applied nitrogen from fertilizer and manure into N2O. Due to a non-linear relationship between application and emissions, as more nitrogen fertilizer is applied, a greater fraction of the applied nitrogen is converted to N2O. Nitrous oxide is also produced when crop residues are burned. Tropical forests and savannas comprise most of the planet’s remaining land that is suitable for growing crops. Because tropical forests and grasslands are dense with trees and plants, clearing them releases much more carbon than in temperate areas. At the same time, tropical croplands tend to be less productive than their temperate counterparts. In fact, newly cleared tropical cropland releases about three times more carbon per ton of crops produced than similar cropland in temperate parts of the world. While non-agricultural emissions of tropical countries account for just 14 percent of global GHGs, when emissions from deforestation are included, the emissions add up to a third (31 percent) of the global total. Today, most countries in predominantly temperate areas, including the U.S. and China, do not have agricultural emissions due to deforestation. Native forests on suitable land for farming were cleared long ago. However, wealthier countries contribute to land clearing indirectly, as their demand for crops or livestock often drive deforestation in poorer countries. LIVESTOCK SUPPLY ONE-THIRD OF PROTEIN FOR HUMAN CONSUMPTION, BUT DRIVE APPROXIMATELY 80 PERCENT OF NON-CO2 EMISSIONS. Between 2000 and 2012, about half of tropical deforestation occurred in just two countries. 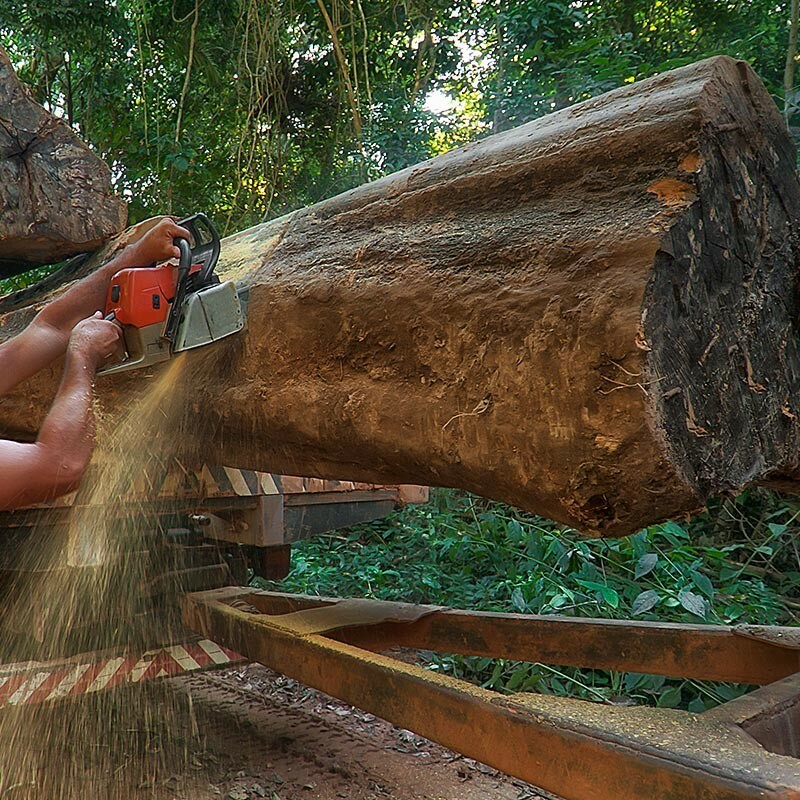 Brazil accounted for 34 percent of tropical deforestation, mainly due to producing timber, cattle, and soybeans. Indonesia accounted for 17 percent of tropical forest loss, mostly driven by the expansion of oil palm and wood plantations. Emissions from agricultural management are similarly concentrated in just a few places. More than half the nitrous oxide from croplands comes from three countries: China (31 percent), India (11 percent), and the U.S. (14 percent). Similarly, producing just three crops—wheat, maize, and rice—accounts for roughly half of global N2O emissions from agriculture. Finally, nearly two thirds of methane emissions from rice cultivation are from China (29 percent) and India (24 percent). Because most of agriculture’s GHG emissions are concentrated in only a few countries, and result from growing just a few crops, it becomes easier to concentrate efforts on mitigation. While different strategies are appropriate to particular world regions, some promise higher mitigation of agricultural GHGs. Practices that intensify production on existing pasture and croplands have the highest potential because they avoid deforestation. There’s significant potential for mitigating or reducing agricultural emissions. Not including fisheries, the global potential is estimated to be about 7.5 Gt CO2e yr-1. Most of the opportunities for reducing agriculture’s emissions are in low- to middle-income countries, but opportunities vary widely between countries and farming systems. In general, mitigation means sustainable intensification, or producing more food on global croplands and pastures that have already been cleared, with less emissions. Right now, the scope for intensifying production on existing croplands is promising. First, in both developing and developed countries, there are significant cropland areas where the current yield is well below the attainable crop yield for that climate zone. Intensifying livestock production, particularly in tropical areas, could reduce pressure for deforestation for new pasture and croplands. This could be achieved through improved grazing land management, including improving diets and breeding strategies for livestock so that existing animals can better satisfy demand. In general, a transition to more productive livestock systems could spare forestland while reducing N2O and CH4 emissions. Recent work suggests that a transition to more efficient livestock production systems could, by 2030, be responsible for as much as 70 percent of total agricultural mitigation, if coordinated with other measures. Nearly all mitigation strategies imply economic, social, or ethical tradeoffs, and without careful implementation are also likely to have unintended climate impacts. Although there’s great potential for intensification, efforts must be tailored to the needs of particular places. For example, the social impacts of mitigation measures vary depending on whether actions are taken within smallholder or large-scale commercial systems. Increasing food production while reducing emissions depends on whether these efforts are accompanied by strong forest conservation policies, national climate adaptation plans, and lower-carbon development strategies for regions and countries. Our best estimates are that global food demand will increase between 60 and 100 percent by mid-century. Even if we meet this demand through sustainable intensification of agriculture, nearly all remaining forests and grasslands in the tropics that are suitable for agriculture would need to be plowed up. In addition, while the total mitigation potential in agriculture is large, the reality of overcoming political, institutional, and social barriers to implement these strategies means that less than 30 percent of agricultural mitigation potential is likely to be achieved by 2030. So, a focus on emissions from agricultural production simply won’t be enough. Recent work suggests that we’ll need to shift global demand for food calories through changes in our diets and reducing food waste. Shifting demand will also require careful attention to differences in food access between developed and developing countries, or within a country, to ensure strategies are equitable. 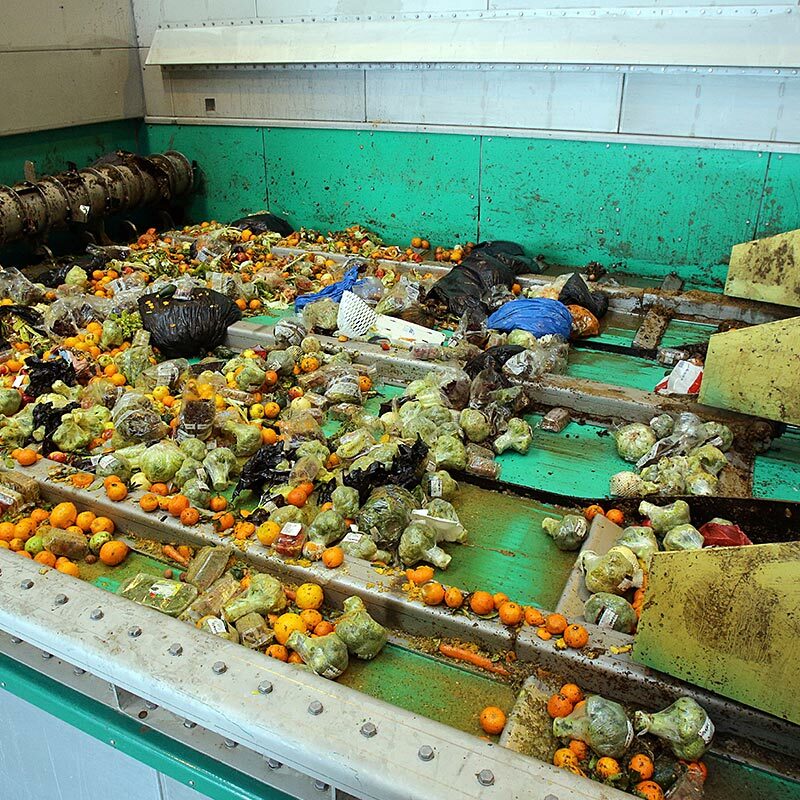 TO CURB GLOBAL EMISSIONS, WE’LL NEED TO CHANGE OUR DIETS AND REDUCE GLOBAL FOOD WASTE. If we depend on current yield trends alone to meet future demand for food, we will need the entire global emissions allowance for keeping global average temperatures below 2°C. That would leave virtually no emissions for all other sectors, including energy production, industry, and transport. Even closing yields gaps and halving food waste will leave less than half of the global GHG budget. Only a combination of all strategies—sustainable intensification, food waste reductions, and dietary change—keep agricultural emissions within safer limits. Easing agriculture’s impact on our climate won’t be easy, but reducing agricultural emissions needs to be in the mix of strategies for avoiding dangerous levels of climate change. Even if all sectors other than agriculture reduce their emissions to the maximum, we will not be able to meet the goal of limiting a global average temperature increase below 2°C. An estimated target for the mitigation needed in agriculture is 1 GT CO2eq/ yr by 2030, which is roughly equivalent to the emissions from all cars on the road in the U.S. today. Doing so will demand shifts in thought and practice throughout the food system. Here’s a sampling of specific solutions. Deforestation tips the atmospheric balance further toward greenhouse gases, but farming demands land, so people often trade forest for fields. The challenge, particularly in the Global South, is to limit logging while still producing enough crops to feed growing populations. In Brazil, commitments by companies have enabled agricultural intensification, and contributed to a sharp drop in deforestation. 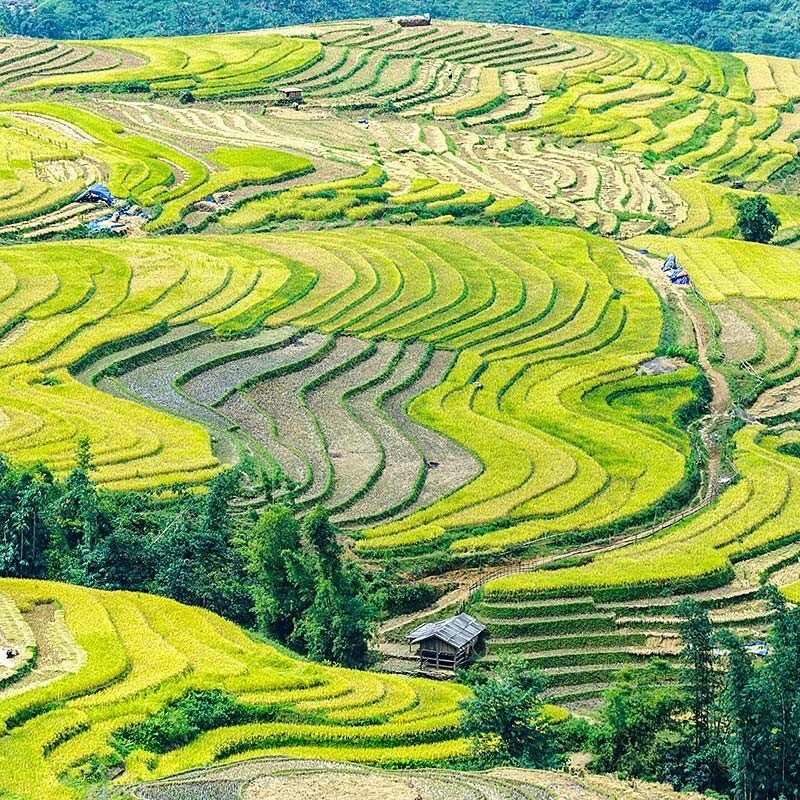 Rice paddies are a key source of food. They’re also a key source of methane. To clamp down on that potent greenhouse gas during the growing season, cultivators can periodically drain their fields. During the off season, keeping soil dry will help. Soil bacteria gather extra nitrogen and use it to make the gas nitrous oxide, a powerful planet-warmer. Inefficient application of fertilizer is the major source of extra soil nitrogen, so smarter fertilizer use prevents unnecessary emissions. 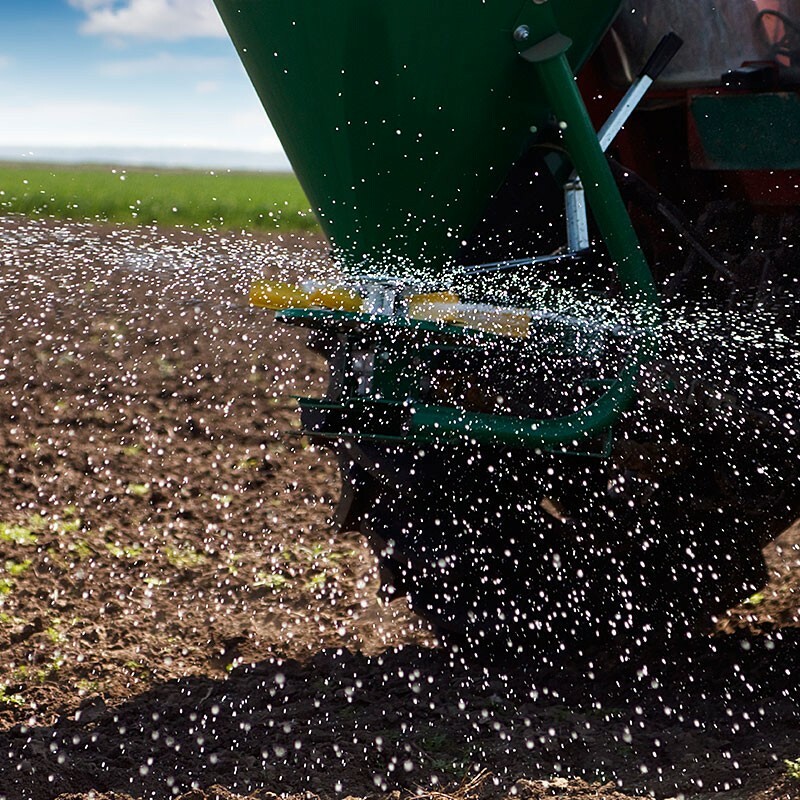 Better practices include ensuring precise application, using slow-release fertilizers, and more. Not all solutions rely on loggers or farmers changing their ways. You can be part of the fix, too. Demand-side approaches include reducing food waste and shifting toward diets with less meat—both of which would require fewer greenhouse gas emissions from agriculture. Credits: Barrett Colombo, Paul West, Pete Smith, Francesco N. Tubiello, James Gerber, Peder Engstrom, Andrew Urevig, Eva Wollenberg. The following people provided data and helpful review: Javier Montero-Serrano (FAO), Eduard Bukin (FAO), Amanda Gordon (FAO), Mario Herrero (CSIRO). Bajželj, Bojana et al. “Importance of Food-Demand Management for Climate Mitigation.” Nature Climate Change10 (2014): 924–929. Print. Carlson, Kimberly M., Lisa M. Curran, Gregory P. Asner, et al. “Carbon Emissions from Forest Conversion by Kalimantan Oil Palm Plantations.” Nature Climate Change3 (2013): 283–287. Print. Carlson, Kimberly M., Lisa M. Curran, Dessy Ratnasari, et al. “Committed Carbon Emissions, Deforestation, and Community Land Conversion from Oil Palm Plantation Expansion in West Kalimantan, Indonesia.” Proceedings of the National Academy of Sciences19 (2012): 7559–7564. Print. Cohn, Avery et al. The Viability of Cattle Ranching Intensification in Brazil as a Strategy to Spare Land and Mitigate Greenhouse Gas Emissions. CCAFS Working Paper, 2011. Print. DeFries, R., and C. Rosenzweig. “Toward a Whole-Landscape Approach for Sustainable Land Use in the Tropics.” Proceedings of the National Academy of Sciences46 (2010): 19627–19632. Print. FAOSTAT Emissions Database. Available at http://faostat3.fao.org/browse/G1/*/E. Last accessed on Jun 13th 2016. Foley, Jonathan A., Navin Ramankutty, Kate A. Brauman, Emily S. Cassidy, James S. Gerber, Matt Johnston, Nathaniel D. Mueller, Christine O’Connell, Deepak K. Ray, and Paul C. West. 2011. “Solutions for a Cultivated Planet.” Nature 478 (7369): 337–42. Gerber, James S., Kimberly M. Carlson, David Makowski, Nathaniel D. Mueller, Iñaki Garcia de Cortazar-Atauri, Petr Havlík, Mario Herrero, et al. 2016. “Spatially Explicit Estimates of N2O Emissions from Croplands Suggest Climate Mitigation Opportunities from Improved Fertilizer Management.” Global Change Biology. Havlík, Petr et al. “Climate Change Mitigation through Livestock System Transitions.” Proceedings of the National Academy of Sciences10 (2014): 3709–3714. Print. Macedo, Marcia N. et al. “Decoupling of Deforestation and Soy Production in the Southern Amazon during the Late 2000s.” Proceedings of the National Academy of Sciences4 (2012): 1341–1346. Print. Scheehle, Elizabeth et al. “Global Anthropogenic Non-CO2 Greenhouse Gas Emissions: 1990–2020.” Version: revised June (2006): n. pag. Print. Smith, Pete et al. “Agriculture, Forestry and Other Land Use (AFOLU).” Climate Change 2014: Mitigation of Climate Change. Contribution of Working Group III to the Fifth Assessment Report of the Intergovernmental Panel on Climate Change. Cambridge, United Kingdom and New York, NY, USA: Cambridge University Press, 2014. Print. Smith, Pete, Daniel Martino, et al. “Greenhouse Gas Mitigation in Agriculture.” Philosophical Transactions of the Royal Society B: Biological Sciences1492 (2008): 789–813. Print. Smith, Pete, David S. Powlson, et al. “Meeting Europe’s Climate Change Commitments: Quantitative Estimates of the Potential for Carbon Mitigation by Agriculture.” Global Change Biology5 (2000): 525–539. Print. Smith, Pete, Daniel Martino, et al. “Policy and Technological Constraints to Implementation of Greenhouse Gas Mitigation Options in Agriculture.” Agriculture, Ecosystems & Environment1 (2007): 6–28. Print. Tilman, David, Christian Balzer, Jason Hill, and Belinda L. Befort. 2011. “Global Food Demand and the Sustainable Intensification of Agriculture.” Proceedings of the National Academy of Sciences 108 (50): 20260–64. Tubiello, Francesco N. et al. “The Contribution of Agriculture, Forestry and Other Land Use Activities to Global Warming, 1990–2012.” Global change biology (2015): n. pag. Print. Vermeulen, Sonja J., Bruce M. Campbell, and John SI Ingram. 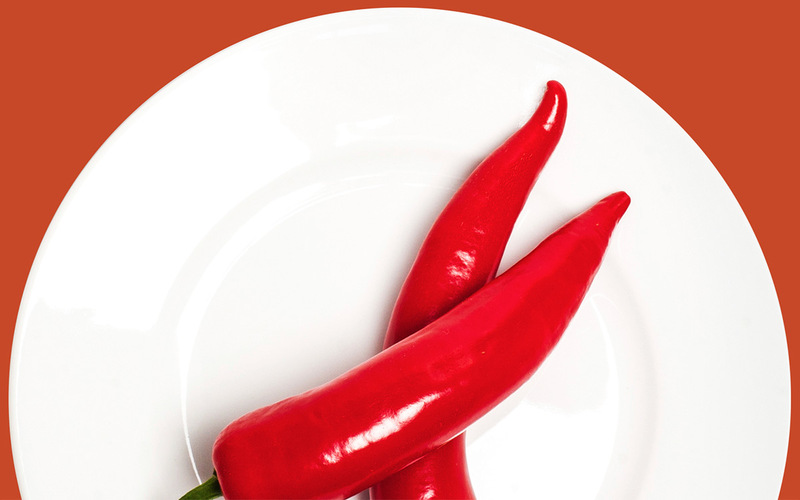 “Climate Change and Food Systems.” Annual Review of Environment and Resources1 (2012): 195. Print. West, Paul C., James S. Gerber, et al. “Leverage Points for Improving Global Food Security and the Environment.” Science 345.6194 (2014): 325–328. Print. West, Paul C. et al. “Trading Carbon for Food: Global Comparison of Carbon Stocks vs. Crop Yields on Agricultural Land.” Proceedings of the National Academy of Sciences46 (2010): 19645–19648. Print. Wollenberg, E., M. Richards, P. Smith, P. Havlík, M. Obersteiner, F.n. Tubiello, M. Herold, et al. 2016. “Reducing Emissions from Agriculture to Meet the 2°C Target.” Global Change Biology.